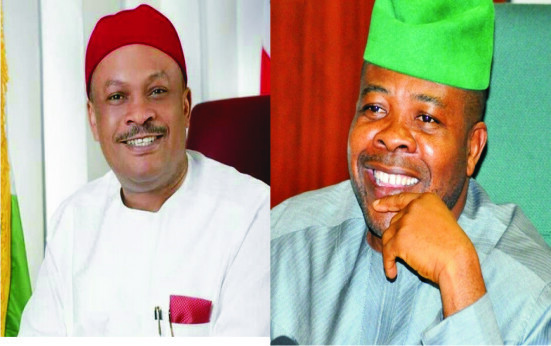 The appeal filed by Chief Emeka Ihedioha against the unanimous ruling of the Hon Court of Appeal justices on his appeal over Hon Samuel Anyanwu’s suit challenging the outcome of the IMO state PDP gubernatorial primaries held on the 1st of October 2018 came up today at the Apex court of Nigeria. At the commencement of the proceedings in the morning of 21 January 2019, parties announced their appearances viz; K. C.O. Njemanze SAN leading L M Alozie for Emeka Ihedioha ( the Appellant), Nnawuchi SAN leading two other Nnawuchis, for the PDP ( 1st Respondent ) Obasi -Obi Esq. for INEC ( 2nd Respondent) and PAUL EROKORO SAN leading Uche Igbokwe, Ik Udeozor & Asika Ilobi for Most Dist. Senator Samuel Anyanwu,( the 3rd Respondent ). K. C O Njemanze drew the attention of our court that he was served with the preliminary objectives raise by Samdaddy ‘s lawyer Erokoro SAN on Saturday but had no time to reply to it hence he applied for 10 minutes to respond to issues raised there in. At this juncture, Paul Erokoro for SAMDADDY applied to withdraw his preliminary objections to allow the matter to go on. There was no objection from Njemanze or any other counsel so the preliminary objections were struck out accordingly. Chief K C O Njemanze adopted his address as filed and urged the court to uphold his appeal. Chief Nnawuchi supported counsel to the appellant but was directed by the Chief Justice of Nigeria not to mislead the court by supporting the upholding of the appeal since he did not file any appeal enquiring what he is teaching the juniors. The judges advised him to comply by withdrawing his position which he did. continuation of the matter by the Fed. High Court. Chief Paul Erokoro (SAN) for Senator Anyanwu also adopted his written address which sought to dismiss the appeal and reminded the judges sitting, of the time essence nature of the matter being a pre-election matter which 120 out of the statutory 180 days has been wasted leaving only 60 days . Chief K C O Njemanze (SAN) made desperate arguments for his case and prayed that even if the matter will be returned for hearing, that the judges order a new judge to hear it accusing the trial Court of lack of fair hearing. He was supported by Mr Nnawuchi (SAN) who was again foreclosed from so doing. After hearing all the parties, the panel of five Justices of the supreme court unanimously held that the appeal lacked merit and dismissed same accordingly with an order that the matter be returned for trial by the same court and before the same Judge whom no proof of bias or lack of fair hearing has been established because to commence fresh trial by another judge is still a ploy to further frustrate the matter and therefore bring injustice to all parties.